BabaCAD is compatible with other CAD software. Open/Save .DWG or .DXF drawings designed in other CAD software. BabaCAD Home edition comes with everything needed for professional draft work, even with LISP scripting enabled. With all these features, BabaCAD Home edition is almost free CAD software if it's price is compared to other professional CAD tools. BabaCAD Enterprise edition is extensible by programming user Plugins (C#, VB, .NET .dll). Add your custom functions/commands to solve specific problems. Use Microsoft Visual Studio development tool with large .NET library and many useful components like Web Services, Database connectivity and more. • Develop and load .NET modules (C#,VB,Java). Code your own commands/functions/modules. 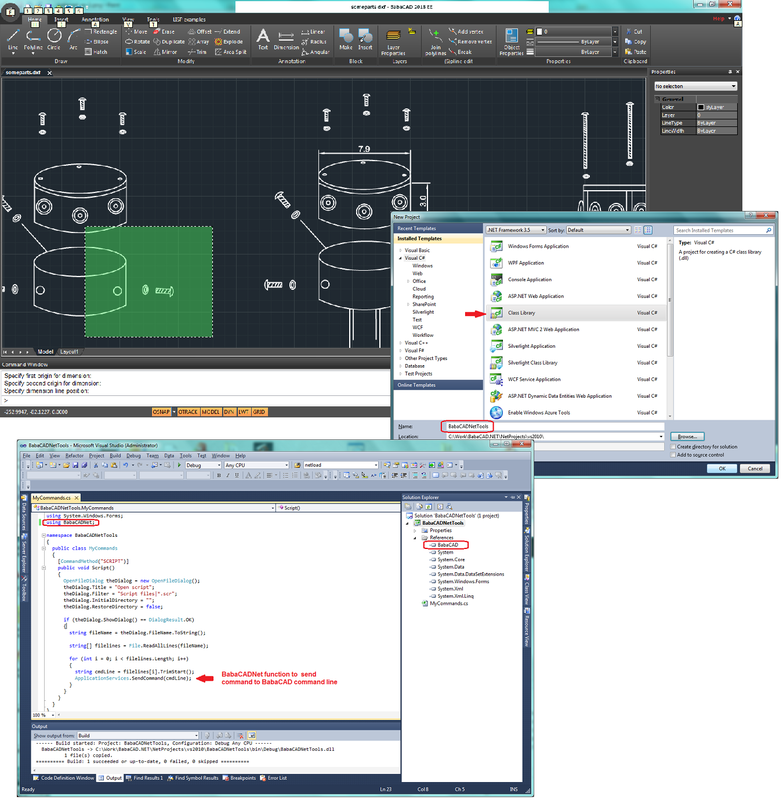 BabaCAD is professional CAD software with full .DWG support, LISP scripting and advanced drafting tools. BabaCAD Home Edition is for CAD professionals and Enterprise Edition is even more powerful for companies to develop custom plugins for their specific needs. BabaCAD Enterprise edition now enables developers to use C# (or Visual Basic) as programming language and .NET framework to extend BabaCAD with custom commands, functions or make some complex software solutions based on BabaCAD platform. 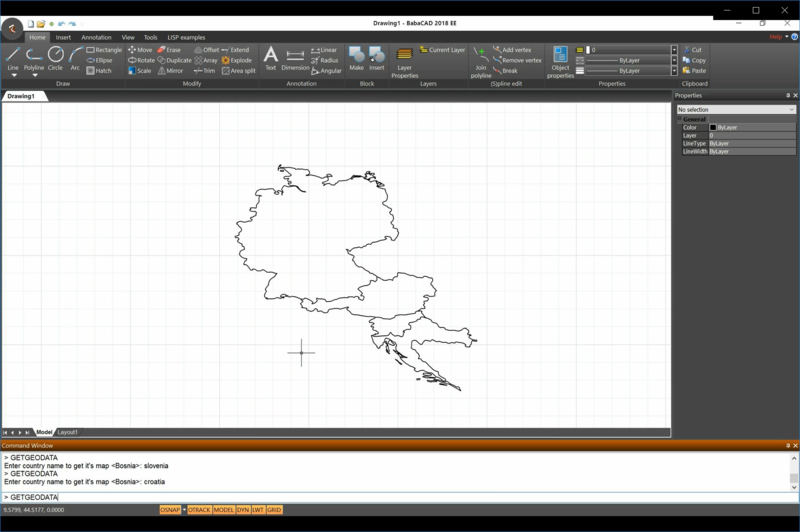 Watch the video on the right, to see how we programmed custom command named 'GETGEODATA' to get boundary geometry of any country (country border) that we specify. Extension was programmed with C# and using basic .NET libraries like HttpClient (to connect to one of many free online web services; in our case web service for country boundaries). Code was written in just a few minutes and contains no more than ten lines of code. After C# project is compiled in Microsoft Visual Studio 2010 (or any other MS Visual Studio version with .NET 4+), .DLL module is copied to BabaCAD NetModules folder and BabaCAD loads it at the startup automatically. 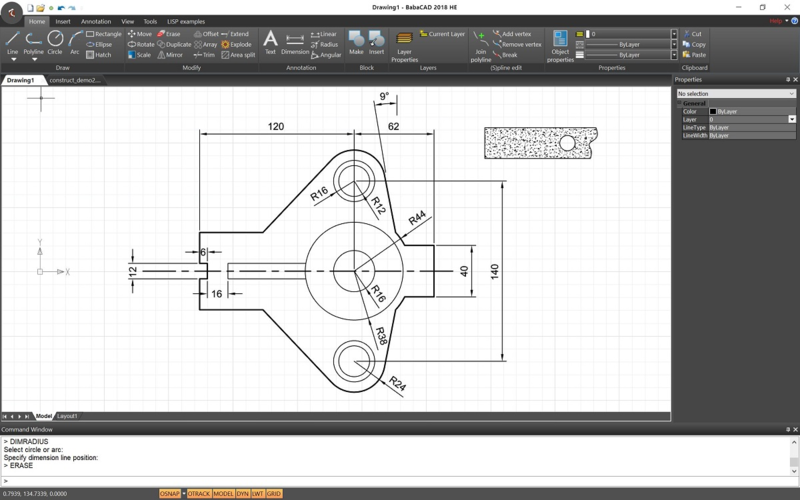 Smart quick dimensioning with linear, aligned, radius, diameter and angular dimensions. Automate and speed up your work with LISP programming for BabaCAD. LISP interpreter built-in. Create your own LISP command icons and load .lsp files on startup. BabaCAD runs fast even on older hardware. BabaCAD Enterprise functionalities in minutes. Developers can use C#, VB, Java to code new commands and functions. E-mail support 24/7. Every licensed user is allowed to fill features wish list. Access to .NET Modules downloads, which will often be updated with new modules and features. .NET Modules can only be used on BabaCAD Enterprise editions, but lisp and .bem modules can be shared across BabaCAD community. Every new version of BabaCAD Enterprise Edition will be available for licensed users, free of charge. Developers will find example .NET Projects under the \Program Files\BabaCAD\BabaCAD 2018 Enterprise\NetProjects folder. Enterprise users will also have access to other source code of future releases of .NET Modules.